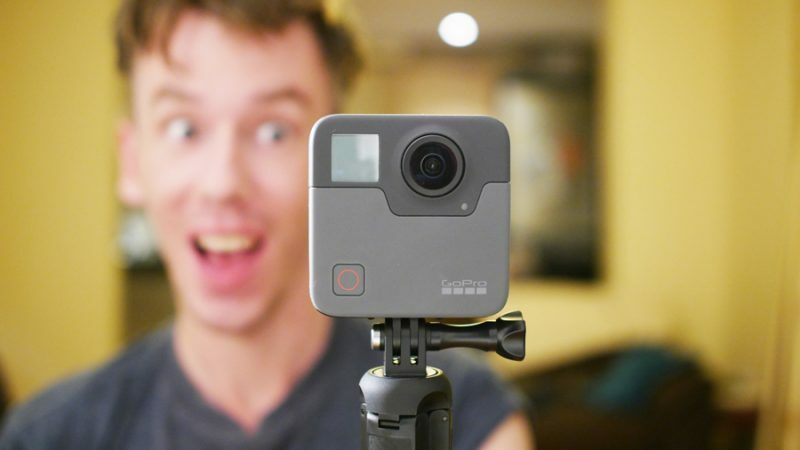 Home » 360 Camera Reviews » GoPro Fusion Review 6 Months Later: Is it the best 360 camera ever? The GoPro Fusion is the most anticipated 360 camera ever. The company that almost single handedly kicked off the action camera industry is now pinning its hopes on the growing demand for 360 cameras. The Fusion is a premium device with a premium price tag, but does it live up to the hype and could it really the best 360 camera ever? In this review I’ll tell you everything you need to know about the GoPro Fusion, from video quality to the stability of the app. By the time you’ve finished reading you should have a pretty good idea whether the Fusion is the right camera for you. Discount: The GoPro Fusion is now just $587 on Amazon, a reduction of over $100. The GoPro Fusion has been designed first and foremost as an action camera, with features that GoPro fans will be accustomed too. The body is coasted in a type of thick rubber, probably to help with waterproofing the device. This material is easy to grip so there is less chance of you dropping it. The Fusion is pretty big for a 360 camera, but still smaller than a DSLR. I can comfortably hold it in one hand and while it’s not heavy, it’s got a certain weightiness to it which makes the camera feel premium. The Fusion has a few manually controls and a LCD display screen. Using these you can pretty much control every Function and change every setting. The power button doubles as a mode selector and the shutter at the front also allows you to explore the different settings available. It’s great that you can pretty much completely control the Fusion manually without having to connect to an app. The Fusion has the standard GoPro mount which you can slide out. You’ll also get adhesive mounts with your Fusion as well as a very useful mini tipod/selfie stick. Most 360 cameras come with a mini tripod but the Fusion’s is by far the best I’ve used thanks to its size and adaptability. You’ll find 2 sliding doors which conceal a USB C port and the battery/microSD ports respectively. The design of these sliding doors is not great and the first time I opened the USB door it slid off, leading me to panic that I’d just broken my $700 camera. Fortunately (depending on how you look at it) this is a common and fixable problem and the door can be popped back in. Still, for such an expensive camera I would not expect bits of it to be falling off. If you are hoping to use your GoPro Fusion with your existing selfie stick/tripod then you’ll probably need to buy an adapter. The Fusion does not come with a standard tripod mount which I think is a glaring omission. The Fusion certainly looks and feels like a premium device, and it’s not failed me in the field so far, however there are a few unnecessary issues with the design which would have been very easy for GoPro to fix. This is the exciting part, because as we all know GoPro’s are built for video. Let me start off by saying that the GoPro Fusion almost certainly shoots the best 360 video out of any camera under $1000; in fact it rivals some pro level cameras that cost thousands. There are a few catches though which I’ll go through later, but first lets take a look at some Fusion 360 video. The Fusion is able to shoot excellent quality 360 video because it uses more advanced optics (lenses) than its competitors. This, coupled with the high 5K resolution, results in detailed video with accurate colors and a high dynamic range. A common complaint surrounding 360 video is that it doesn’t look high definition, due to the fact that the pixels are spread around 360 degrees instead of 90 degrees like a flat video. The Fusion comes closest to reaching that HD look in 360 without buying a professional rig. I’ve used a lot of 360 cameras over the past few years and what really stands out about the GoPro Fusion is how detailed the video is. Even when zooming in there is minimal loss of quality and even in the distance you can pick up distinctive colors and details. Remember that YouTube significantly reduces the quality of 360 video when uploaded to its servers, so the same video played on a native desktop/VR headset player will look even better. Hands down the best 360 camera for video ever! A unique consideration for 360 cameras is how well can they stitch together the video to avoid an unattractive seam line. Many cameras have tried and failed to perfect this and it can the downfall of even the most promising devices. Thankfully the GoPro Fusion stitches 360 video almost perfectly as long as you don’t have any object wthin a few cm of the lenses. As you can probably tell I do really like the 360 video coming out of the Fusion, but there is still room for improvement. The Fusion tends to overexpose the brightest areas and even though it’s one of the better cameras for low light video, it still produces a lot of noise in the darkest spots. Software updates have imporved video quality for other cameras, so many these issues can be tackled in the future. If you’ve never used a GoPro before you may not have heard of Protune. It’s a video mode available on GoPro cameras that essentially offers you much more manual control over your image. With Protune on you can change ISO and exposure to adjust for different lighting conditions, it also gives you more scope for editing in post production. As far as I can tell the video quality is slightly higher with Protune on, so I would recommend keeping this mode activated at all times even if you have no interest in editing or manual control. As I made very clear before, I do think the Fusion shoots the best 360 video of any consumer 360 camera, but you are paying a high price and there are cheaper options out there. The closest competitor in terms of video quality is the Yi 360 VR, which shoots at a higher 5.7K resolution but has inferior optics. That said, the difference between the two in terms of quality isn’t huge, and with some color correction the Yi 360 video can look stunning too. The Yi 360 is half the price of the Fusion, and while it doesn’t have all the action camera features, it’s a ridiculously good price for a 360 camera that can shoot video this well. The Fusion is one of only a few 360 cameras that’s waterproof without the need for an extra case. You can take your Fusion underwater up to 5m and it will work just as well as on dry land. So does this mean you’ll be able to shoot some epic under the sea footage? Probably not. It’s not the GoPro’s fault, but an issue with all 360 cameras which means underwater filming is difficult -that issue is called refraction. Essentially, being underwater messes with the stitching software and causes a very obvious stitching line; so while you can shoot in 360 underwater with the Fusion, it’s unlikely to be seamless. Being waterproof is still a great feature though, as it means you can take it surfing, skiing, swimming or any other water based activity and it won’t break. A very important feature for any 360 camera is software stabilization, and there have been some dramatic improvements over the past year. The Rylo 360 camera is able to stabilize video almost as well as a mechanical gimbal (I’m convinced it’s witchcraft), and the Insta360 One can smooth out shakes and virbrations even when running. Can the GoPro match up to these cameras? The Fusion 6 axis stabilization with horizon correction and anti shake. The stabilization is applied during the stitching process on the desktop or mobile app. I’m happy to report that in both cases the stabilization does a very good job as keeping your video smooth. While it’s not on the same level as the Rylo, the Fusion stabilization is more than good enough to smooth out action shots or the vibrations from walking and running with the camera. Essentially overcapture lets you turn your 360 video into a normal flat video, but also allows you to choose where camera should be pointing at any given time. Basically is allows you to shoot first and point later, opening up a lot of creative possibilities. There are quite a few 360 cameras that can create this type of video, but the Fusion does it best. Why? Because the video quality is so high and the stabilization is so good. Over-capture requires smooth video for maximum control and high quality because it zooms in on your 360 video. I’m of the opinion that overcapture is one of the best features of the GoPro Fusion and it has more mass appeal than a 360 video. The Fusion can do both very well which makes it one of the best devices for capturing video period. Overcapture does have a bit of a learning curve, and you’ll need Premiere Pro (with a free plugin) to do it well, but the end result is more than worth the effort. Anyone who’s worked with cameras will tell you to never use the internal microphones and to record sound externally. Usually I would agree, but that’s not always possible with a 360 camera – especially if you are gonig to be movingaround with it a lot. The Fusion has multiple microphones built into its body, allowing it to shoot 360 ambisonic audio. Ambisonic audio is really a must have feature for 360 cameras, as it allows the sound to match the immersive nature of the video. With ambisonics you’ll hear sounds coming from the direction in which they were made, making for a much more immersive experience that 360 video is supposed to provide. I won’t lie and say the quality of the audio is amazing, because there is a limit to what internal mics can do, but the ambisonic effect does work. Achieving this effect can be very easy or not so easy depending on how you do it. The Fusion will always record ambisonic audio and you’ll select if you want to use it when rendering in the desktop app. If you want to upload straight to Facebook or YouTube the app will provide you with a simple option to ensure the ambisonic audio works, which it does. However if you want to edit your video in another program, like premiere pro, then you’ll need to work out how to re-enable the 360 audio in that program and render appropriately. Depending on your expertise this could be an annoying extra step, but worth it if you want a much better 360 experience. Like all 360 camera the Fusion can shoot video and photos, however it’s been well established that few 360 cameras do both well. The Fusion, like all GoPro’s, is certainly geared towards video, but surprisingly it’s a pretty decent camera for 360 photos too. The Fusion can shoot 18 megapixel photos, which is fairly average compared to other 360 cameras. The lower than ideal resolution is made up for by the excellent lenses which produce detailed and colorful images. On a mobile device the images look very good as the resolution doesn’t really factor in, but when viewed on larger screens you may notice some blurring around the edges. The Fusion can shoot in RAW which opens up a lot of editing and color correction options and with time you could create some stunning photos with awesome dynamic rage. I still wouldn’t recommend the Fusion for professional 360 photography as it lacks some must have features such as bracketing and a TIMER. Seriously, I have no idea why GoPro refuses to put a timer into its software. 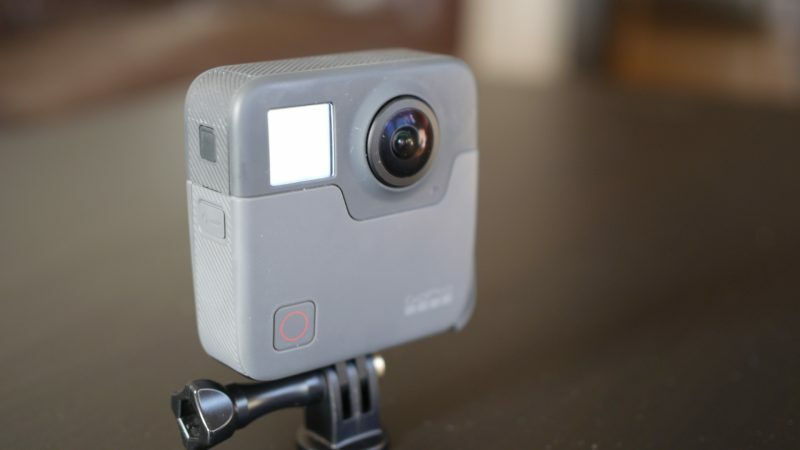 It’s a must have feature for all 360 photos as many people want to get out of the image before the camera shoots, which is difficult in the 2 seconds the GoPro gives you. I really hope that GoPro will add this feature at some point as it’s such a basic omission. So here is where things start going south. My experience using the GoPro app was at first almost entirely negative. For a start, the App simply couldn’t connect to my Samsung Galaxy S8, stating that the phone couldn’t handle the 360 video. However, it could connect to my much older iPhone 6. The Galaxy S8 is compatible with the Fusion according to their website, but it doesn’t seem to be a guarantee. A few months later the situation improved and the app became easier to connect, but without doubt the app is the weakspot of this cameras eco-system. When the app does connect, it’s extremely slow and prone to disconnect at random intervals. If you can get the app to connect for long enough, then there are plenty of settings to play around with such as exposure & ISO. You can also view you photos/videos and stitch them in your phone. Using your phone only allows you to render to 4K rather than the full 5.2K and you won’t be able to transfer the footage to your PC if you use an iPhone. The main use of the app is as an external shutter, so you can shoot 360 photos and videos without being in the shot. Unfortunately the app disconnects as soon as you step a few feet away so it’s not particularly useful in this regard. Unfortunately the app is a bit of a fail for me, which is a shame because it makes using the GoPro Fusion frustrating at times. Fortunately you can control most aspects of the camera manually so you don’t actually need to use the app to get the most out of the Fusion. 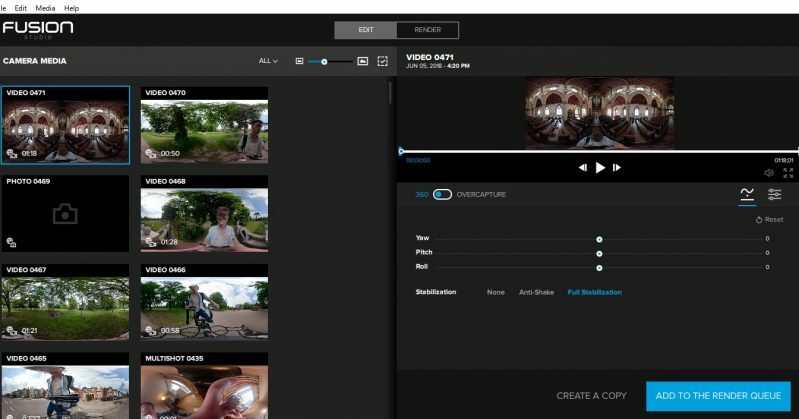 While the app is a disappointment, GoPro wins back some brownie points with their Fusion Studio desktop software. The Fusion Studio is where you stitch and render your videos and photos, and it’s very easy to do so. All you need to do is to connect the Fusion with a USB C and the software will detect the media. You’ll see all of your files on the left hand side, while on the right you’ll see your editing options. This is what makes the Fusion Studio a great piece of software, you can do quite a lot of editing before you render out your final video. You can trim, adjust color, light and exposure to drastically alter the final image, or just leave it as it is. 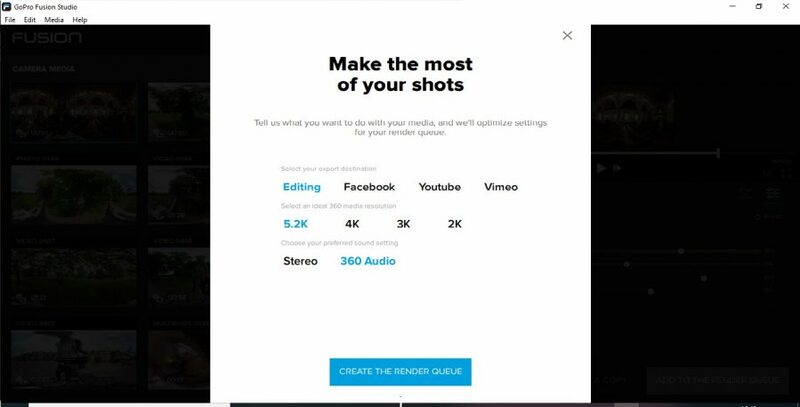 Once you’ve finished editing you can add your media to the render queue, here you can select how you want to render your video. 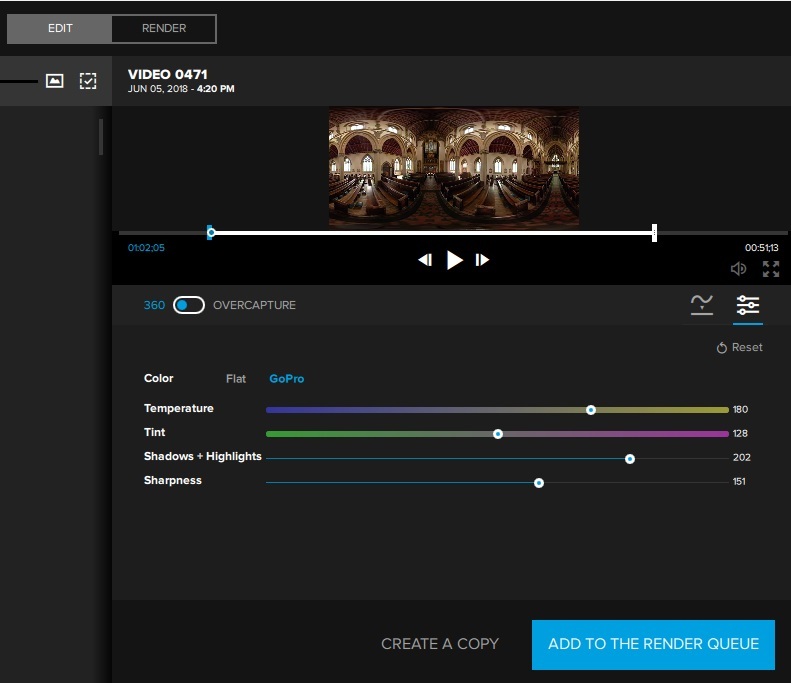 You’ll notice three options for rendering video, H.264, CineForm & Prores. These are the codecs available and each will result in a different size and quality image. Unfortunately the simplest codec, H.264, will only allow you to render at 4K, leaving out a lot of pixels. The other two codec’s are able to produce the highest quality video, but are very difficult to work with an can lead to huge file sizes. Prores in particular is a nightmare if you are using a Windows based machine, as it’s a codec developed by Apple. To make things a bit easier, the Fusion Studio offers a few options depending on where and how you want to use your video. If you want to upload straight to YouTube then you can select this option and you won’t have to do anything else. This is a great time saver, but I tend to edit my videos in a separate editing program before sharing on social media, which is where the difficulties lie. So even though the Fusion Studio is a great piece of software with many useful features, the resulting file types are not for the fainthearted and results in a more complicated workflow than I’ve experience with other 360 cameras. 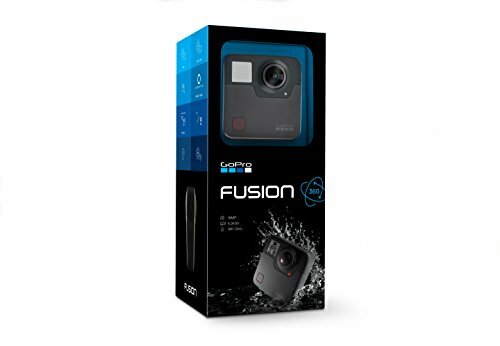 The GoPro Fusion has so much potential; it can create stunning 360 video, the overcapture feature is awesome and its water resistance and stabilization seal the deal. While the Fusion can definitely shoot the best 360 video of any sub $1000 camera, it can be a painful journey. There are so many small issues that make using the Fusion frustrating at best and impossible at worst. Thankfully many of these issues are being dealt with and in 2019 the camera is much more stable. Even better is the heavy discount which makes the Fusion under $600. If you can work through the software bugs and the long workflow, then you’ll be rewarded with near professional quality 360 video. I wouldn’t recommend this as anyone’s first 360 camera, but for those looking to upgrade or even enter the professional realm, the GoPro Fusion the best, but imperfect, camera for you. I’ve watched other reviews which panned the desktop software, i.e. : digital trends software kept crashing. What computer setup did you use? Can the output be connected to a VR headset or an augmented reality app for mobile devices? Maybe my question should be can the data from the Fusion be downloaded and manipulated by 3rd party software? I’m completely new to all and am very happy to have stumbled onto your website. “I still wouldn’t recommend the Fusion for professional 360 photography” – and what camera can your recommend for photos (street virtual tours)? 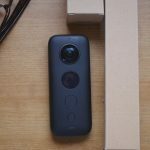 Insta360One, ricoh theta V, mi sphere ? I have been considering getting rid of my six gopro hero 4 / Freedom 360 rig and buying a virb or fusion mainly due to the extra work involved in the stitching process however after watching multiple videos and reading this article the multi cam rigs still offer the best video quality and resolution (8k +) for the money. I think I’ll keep it a while longer.